Age-related macular degeneration, the gradual degeneration of the macula, is the primary cause of sight loss in the western world in patients aged over fifty. More than 25 million people currently suffer from this illness in the world, with an additional 500,000 every year, approximately. There are many subtypes of AMD but basically two broad forms: wet or exudative and dry or atrophic. What are the effects of wet AMD? The AMD is a degenerative eye disease that affects the area of the retina specialised in pinpointing details that helps us to read and make out people's faces (the macula). 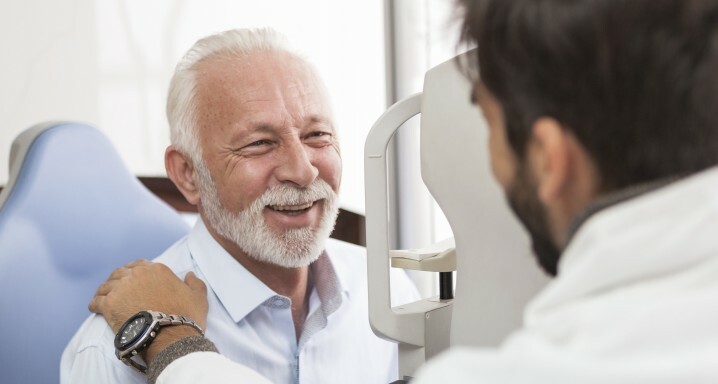 Exudative AMD, also known as wet or neovascular AMD, is the less common form of age-related macular degeneration (about 15 %) but tends to progress more rapidly. It requires immediate treatment to stop the central vision from being irreversibly destroyed within a short period of time (weeks or months). This illness produces haemorrhages and leaks within layers of the retina, principally in the central zone: the macula. These haemorrhages, caused by small, abnormal veins (choroidal neovessels) that invade the retina from the layer below it (the choroids), end up destroying the neural architecture of the macula and lead to loss of vision right in the centre of the visual field. Those suffering from AMD gradually lose central vision, making it difficult to carry out tasks that require precision, such as driving, reading or writing. Sufferers cannot recognise a person's face but they can walk without stumbling and remain relatively independent. On the other hand, it may be difficult for them to estimate distances and heights, making going up or downstairs problematic. This illness usually begins in one eye although it ends up affecting both. For this reason, patients may not realise they have a problem with their sight unless, by chance, they cover up the healthy eye and start to see distorted lines with the affected eye (metamorphopsia). As this illness is associated with age, AMD cannot be prevented. Greater incidence has been observed in smokers so that having a healthy diet, not smoking and undergoing regular eye tests as from fifty years of age should be the measures taken. The last few years have seen highly significant advances in the treatment of wet AMD which have revolutionised the treatment for this illness and have provided new hope of preserving the sight of our patients. Exudative AMD is controlled through the application of anti-angiogenic drugs, through intraocular injections directly into the vitreous cavity. The drug acts by blocking the molecule that causes the development and progression of neovascular membranes. This treatment halts the disease in three of every four cases and improves it in one of every three. In order to achieve these results, it is vital to make an EARLY diagnosis when there are still no apparent symptoms or in the initial stages of the disease. This line of action is shared by all ophthalmologists although what often happens is that treatments are halted when the disease has stopped progressing without taking into account that this is a chronic condition. At the Institut de la Màcula, an institution that is a global benchmark in the field of AMD, we apply a differential treatment with the aim of warding off the disease by retaining the highest possible level of vision, this over an extended period of time. To prevent a reappearance of the disease it is essential for treatment to be proactive and take the lead, with the patient receiving the necessary number of intraocular injections. Unfortunately, we know that in many European countries, patients go under-treated, receiving on average six injections in two years. According to a variety of studies and scientific evidence alone, in the first year, the recommended number is a minimum of seven. At the Institut de la Màcula, we apply proactive agreed guidelines in order to optimise efficacy and safety outcomes, performing the injections that each patient needs. The benefit obtained through the treatment needs to be maintained for as long as possible. Leading studies, such as those conducted by Australian research groups, show that sufficient treatment over a long period enables vision to be retained for many years. Regrettably, this is not common practice. At the Institut de la Màcula, our treatment is long term, with rigorous monitoring and extending whenever possible the application of intravitreal injections but without halting the treatment for years. This is the only way to retain vision beyond the short term. Prior check-ups: a thorough ophthalmological examination is required, including a retina scan, autofluorescence, optical coherence tomography, fluorescein angiography and, in some cases, indocyanine green angiography. Intervention: carried out under local anaesthesia (drops) and is generally not uncomfortable. This is a short procedure carried out in an operating theatre or surgery but always under strictly sterile conditions. Precautions: before intervention, the eye and eyelids are thoroughly disinfected using iodine solutions. Risks: as with any procedure, the most serious risk is an eye infection but, if the eye is correctly disinfected before the operation, this risk is extremely low, less than one case in every thousand patients. 16/01/2015. A delphi study to detect deficiencies and propose actions in real life treatment of neovascular age-related macular degeneration.